No.1—You hold the bottle thus. No.2—You lift the handle so, and then press down. No.4—Cork is pulled and discharged. 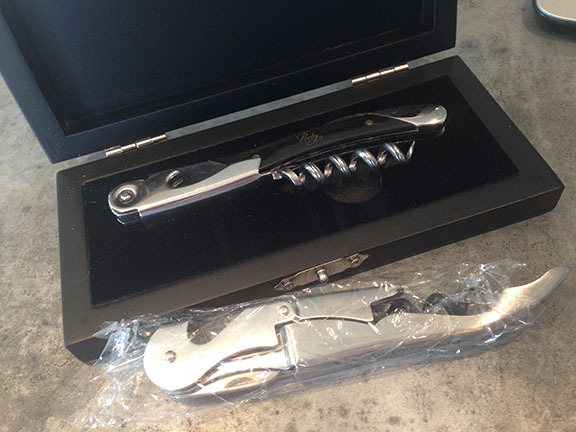 While the wine shop has been quite the focus over the last week, there were a few corkscrews that recently arrived. A few I knew were coming, and then there was a small box from RL with a few b-day gifts. Thanks RL. The Hercules Frary arrived, and it is indeed a duplicate–in nice shape too. And, there is that Haff with the button, pictured next to another metal handled Haff that RL sent. 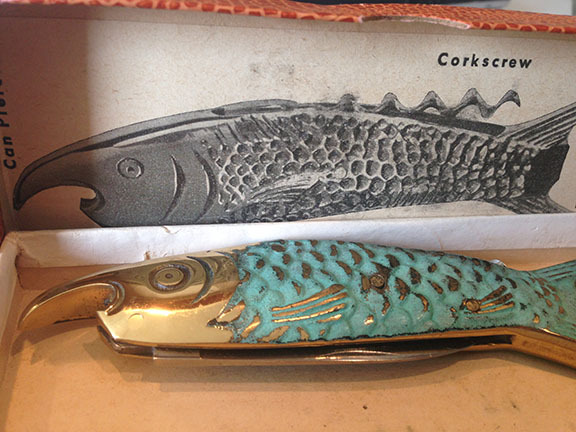 I did pick up one of those metal fish corkscrews with the fold out corkscrew and knife, with the addition of the box, it is a neat little piece. And, there were a couple of nice modern waiters, that RL also sent. And, here is the newest addition, without the hammer. Not sure if it ever had one, but it certainly has a nice nickel finish. 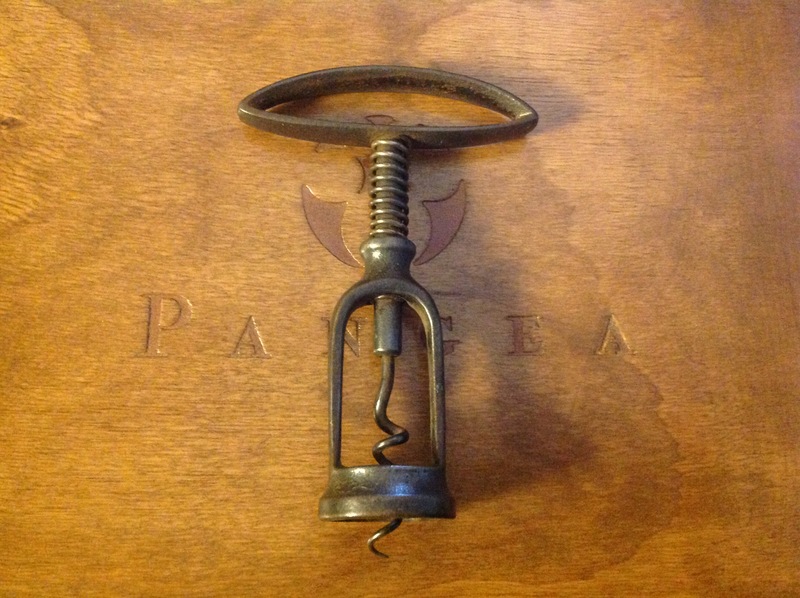 Note: The Austin patent in our collection is marked with the patent date “PAT 10-17-82.” There was a relatively recent auction for an Austin patent corkscrew that was on eBay that showed a mark for BOSTON. Do you have an Austin with a different marking? If yes, drop me a line. I just can help myself. 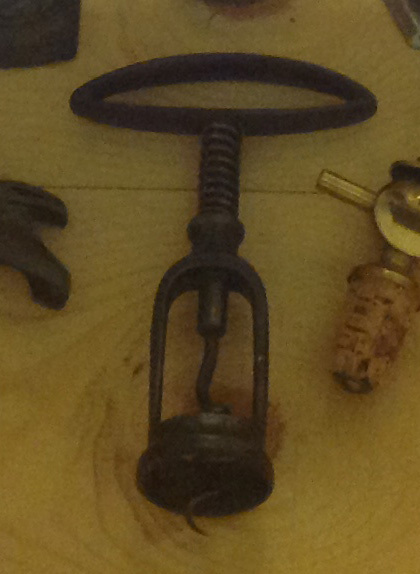 ..
A couple of weeks ago, I was sent a few pictures from a collection, and in amongst the various corkscrews that were of the common variety, was a Frary with Hercules frame and oblong handle. 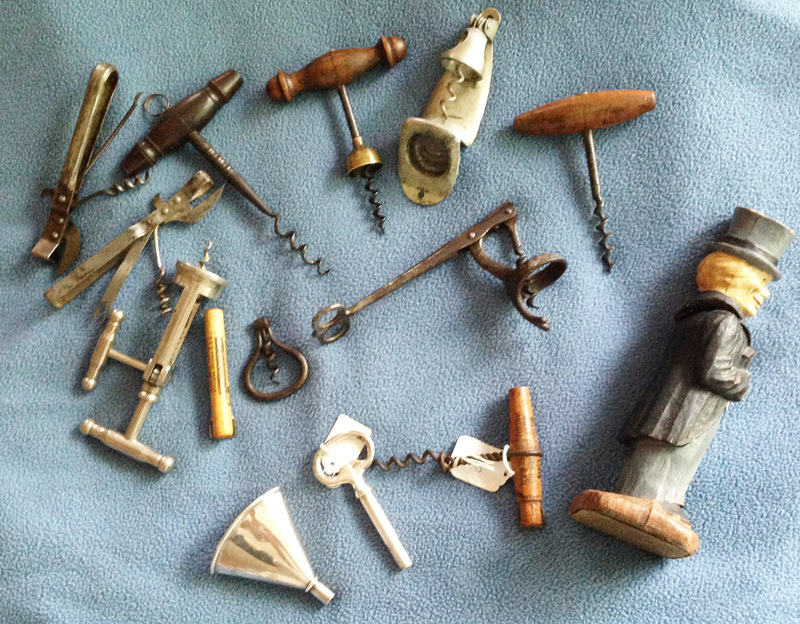 So, I sent an email inquiring about that particular corkscrew. And, the seller was less than responsive. I gathered from their lack of response, that either they didn’t want to sell, or they missed the email. I let a week pass, and I emailed again, just to check in. Well, technically, they did respond, but instead of saying that they were interested in parting with the Fray, they sent additional pictures of other corkscrews. Having received additional pictures, I looked closely, and then (again) inquired about the Frary. …to which I got no response. Figuring that they were still undecided on whether to sell the piece or not, the other day I threw out a number that I thought was rather healthy (healthier for the potential seller, rather than me). And, the person finally responded. And, so after a few weeks of waiting, a deal was done. An oblong (squashed) handled Frary with Hercules frame is heading to the collection. When it arrives, I will report back here. And, if it is different, it will be added to the Frary corkscrew page. If it is actually a double, it will be placed on the potential trade pile, for those that might be interested. I will preface this by saying, Island Spirits officially opened today, and it was well received. Folks that had been in the shop previously (before renovations and re-design) were pretty wowed. It really makes the long hours of construction, design, and renovation worth it. And, with the lovely bride’s added “bling;” a chandelier just above the shop counter, the shop makes a definite statement. Also, we added some really great wines, with more to come. On the corkscrew front, on Etsy (in between selling wine, and ordering more wine) I picked up a cool Haff patent with Clough worm. I have had similar before, but not with the button; an interesting combination. I will add here, that several years ago, I had a Haff handled corkscrew with a Clough wire worm, and whilst sitting behind my table at the ICCA AGM buy and sell, Fred O’Leary and the late Lehr Roe engaged in an impromptu bidding war for my Haff/Clough. 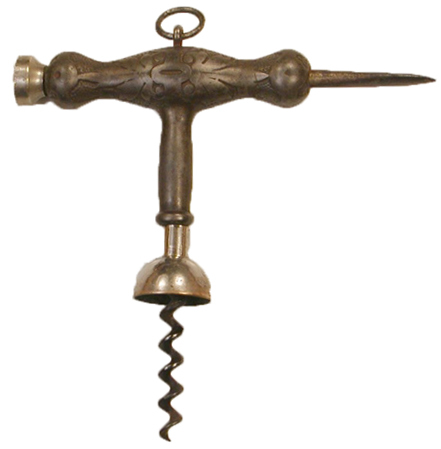 They both saw it as they walked up to the table, and apparently both wanted it, and what started as a few dollar corkscrew, soon ran up well-over a hundred. Honestly, I don’t remember which Addict ended up as the winning bidder, but it was all good fun! Tomorrow it is back to the shop! But, if I uncover any corkscrews, or if some random customer comes in with an antique corkscrew, I will update the blog immediately! Ten years ago today, I started this blog. It started as a lark, and at some point the blog site that I was using migrated to wordpress, when that happened, the photos that we published on the original blog were no longer available. And, without those, many of the blogs are a little less than worth reading. 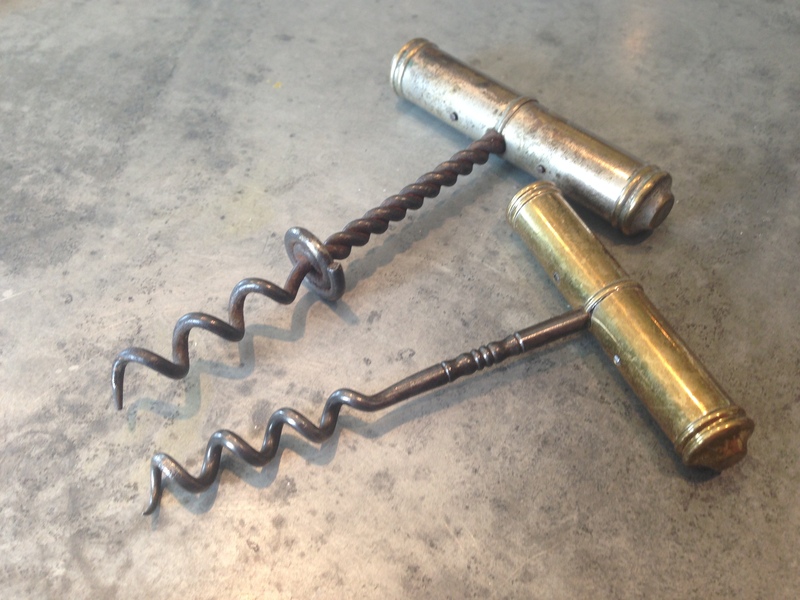 It has been a fun experience sharing my random thoughts on corkscrews, occasionally on home renovations, the lovely and my adventures, and more recently a few postings about the new wine shop that opens, officially, tomorrow. While there is the occasion that I might skip a few days, and rare occasions a little longer, the blog has provided a venue to meet different collectors, have new collectors ask questions, and try to provide some history about a few of the corkscrews that have found their way into our collection, a few that have found their way out of our collection, and a few that hopefully someday will be uncovered and unearthed at some antique show or fair. Thanks for the past 10 years, and I will continue the hunt, and when corkscrews turn up, will report back here. 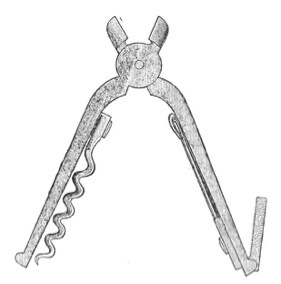 A while back, I mentioned the fantastic Japanese patented corkscrew that Ian Hunter presented at the 2014 ICCA AGM “Show and Tell.” He had a video of himself using the corkscrew, and then in the last issue of The Bottle Scrue Times, there was a detailed article about the piece. As it happens, and with Ian’s permission, the article and the video have been added to both the members and the public The-ICCA.net website. 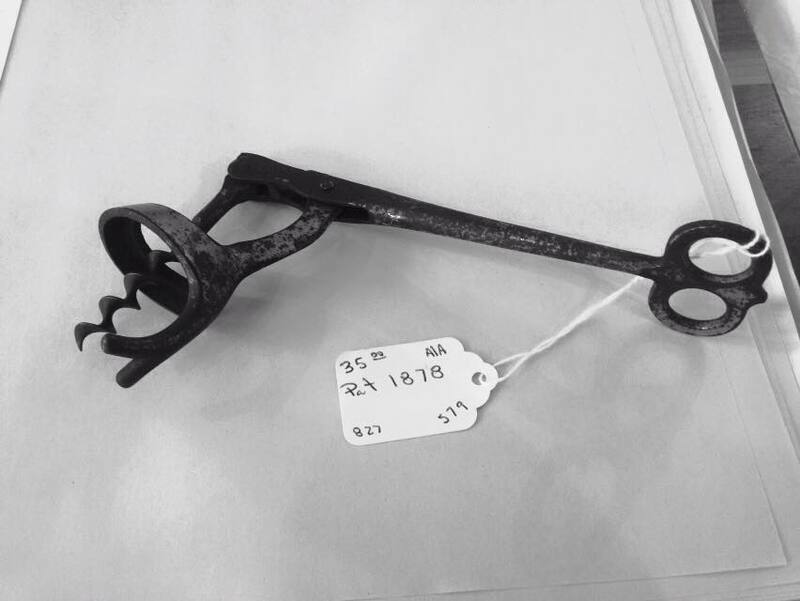 You can also read the article that Ian wrote, about this particular corkscrew, if you visit the The-ICCA.net and click on the library link. Or, you can simply link to it here. This is a very special find! And, how cool is it that we have a video to see how it is used. 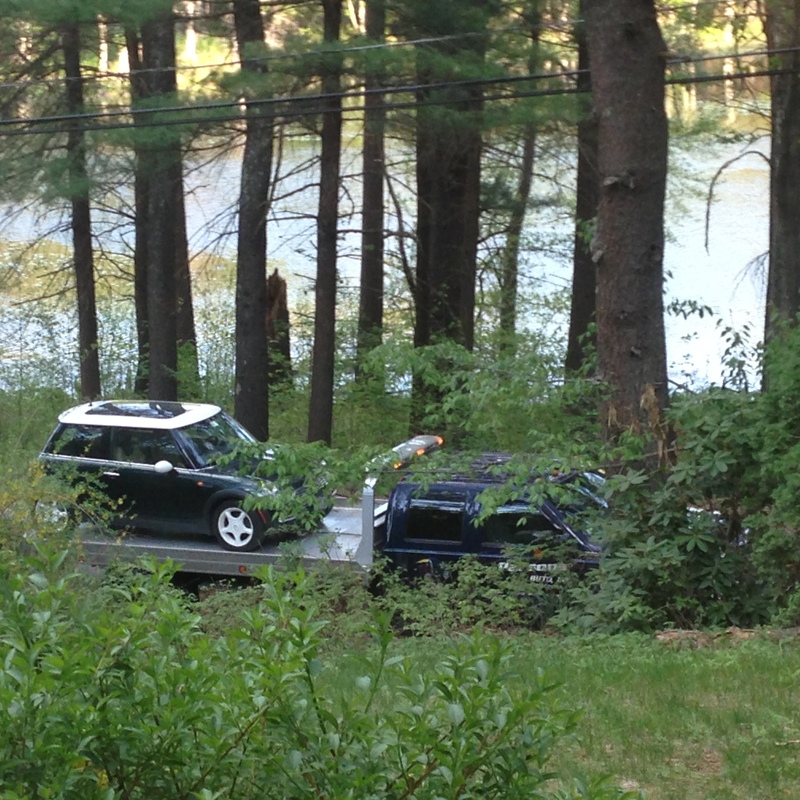 I will preface this by saying, when the lovely lovely personal personal trainer pulled up in the Mini, having run like a top all the way down to Sturbridge, as she pulled in front of the house we were renting, the Mini seemingly began to lose its brakes. The lovely, however, doing her best Danica Patrick impression as she headed up the driveway, got there safely with our friend Alison serving as co-pilot (or co-Danica, as it were). After looking at the car with TC, it seemed that the mini had a leak in its brake line, and in short order, phone calls were made to the various mechanics, AAA, and a new plan for Brimfield day two was put together. Fortunately we are gold members with AAA, and after a while a tow truck came, picked up the mini and took it to a dealer in Boston–some 60 miles away. One vehicle down, we still made it to Brimfield Wednesday as mentioned the other day. 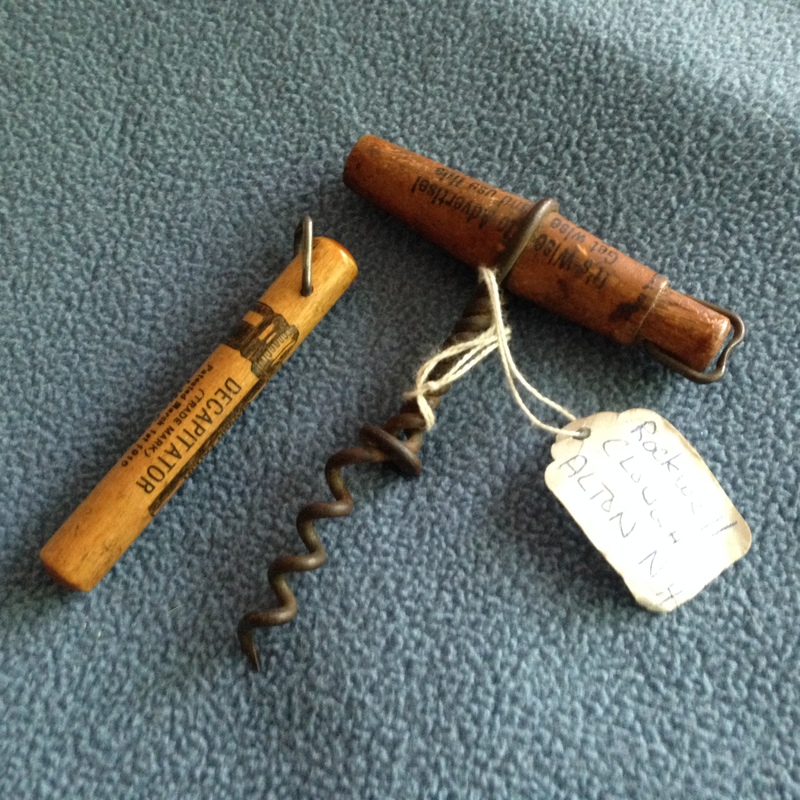 And, during happy hour after our return, there was yet another corkscrew find that was shared. It=t is quite the tale, and the lovely will fill you in later. On Thursday, TC and I departed early to line up for May’s. And, we ran into another corkscrew collector. His first time at Brimfield in many years, we talked corkscrews, and corkscrew folk, and he promised to send pictures of his collection. Just as the gates were about to open, the lovely called, and said she, Alison, and Betsy were pulling in to the church parking lot just down the street, and would soon be traipsing around May’s field as well. Before too long, we all crossed paths, after a lot of texting as to where each of us was. Not a lot of corkscrews at May’s this time around, but I did pick up 4 or 5, and prior to the field opening scored a DICO. Not the DICO corkscrew mind you, but a nice DICO go-with. 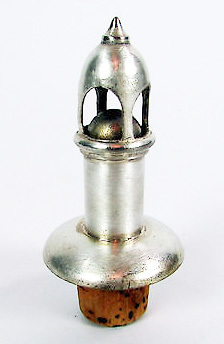 Apparently, at some point in their history, the Diamond Instrument Company also made a stopper/pourer. The one is marked on the bottom DICO WAKEFIELD, MASS. Having exhausted May’s–making three trips around–we all headed off to lunch, and then did a bit more hunting on our way back to our vehicles. After heading back to the house we had rented in Sturbridge, we cleaned up a bit, and soon I was whisking TC back to the airport where he would be heading back to Chicago. After saying goodbyes, and agreeing that this was a fabulous trip, I headed back to Sturbridge where the lovely was preparing dinner (and a yummy one at that). The vodka tonics were flowing, as was the ongoing conversation, and it was one last fun evening. The next morning, the lovely, Alison, and I hopped in the x-terra, and headed back to Boston to pick up the soon to be repaired mini. And, after dropping the girls off, I started the drive back to Rockland to catch the boat, but not before picking up the latest edition of The Bottle Scrue Times from the printer (and 7 cases of olive oil for the shop). And, we open the shop in just a few days. So, it is time to stop corkscrewing around for a few, and get back to the wine shop. Still, if anything turns up, I will report back here. For those that receive the BST, it will be mailed on Monday! Let me preface this with apologizing for not reporting on day one of Brimfield. I will do my best to make up for that by reporting on both day one and day two. But, before we start with day one, we need to start with the drive down. On Monday, I hopped on the first boat, and after running some errands (which included dropping of the latest edition of The Bottle Scrue Times to the printer) I started the drive down to Hartford to pick up Tommy. With little time for antiquing, I decided to make a quick stop for aa coffee, and well…since there is an antique shop across the street, perhaps I could enjoy the coffee there, and then make up some time on the road. It was worth the stop. 50 dealers in a fairly small shop, and everyone assigned a glass case. All smalls really. And, I had visited 44 of the cases, rather briskly, and then out of the corner of my eye, I saw a helix. A helix attached to a lever. With a price tag of 35 dollars. 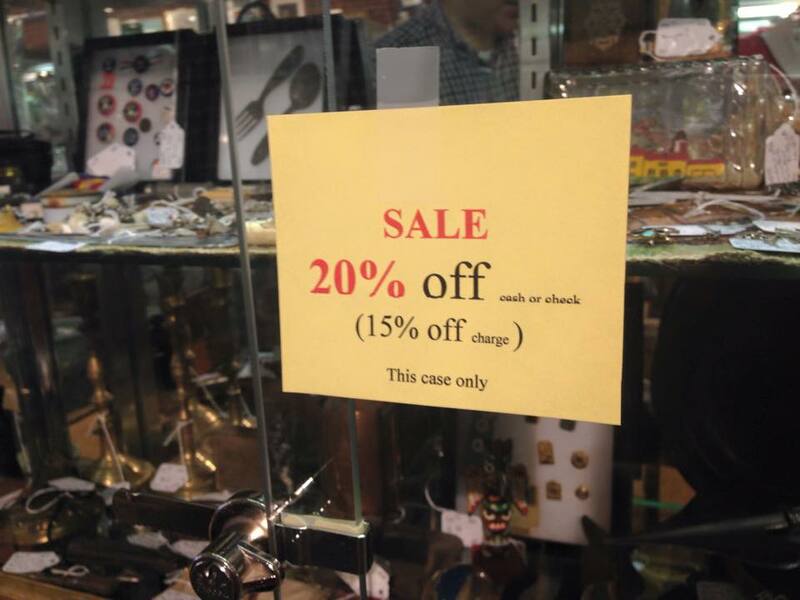 In a 20% off case. After paying my 28 dollars, I finished my coffee, hopped back in the x-terra, and made it down to Hartford with time to spare–smiling ear to ear over the Tucker find! This year, the lovely bride and I rented a house for the Brimfield adventure, and invited a few friends along; Tommy, Alison, and Betsy. Betsy arrived shortly after Tommy and I pulled up. And, we had a casual dinner, and planned for an early morning–arriving at Brimfield at daybreak. This first day, there wasn’t a whole lot of corkscrews available to be had; not even overpriced ones. Still, Barry had picked up a couple, and I managed a folding bow, and a simple Murphy t-pull. As we would bump into each other at the various fields however, “nothing” was the usual comment. Of course, that can change at any moment. 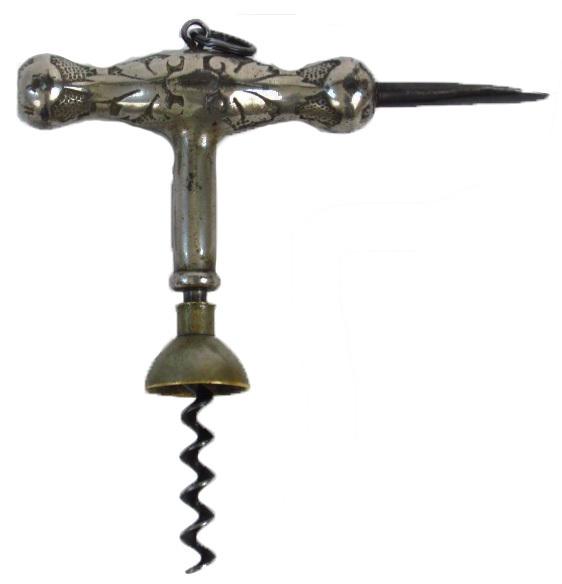 At Dealer’s Choice, I did manage to pick up a few interesting corkscrews, a really handsome T-pull, and just before that, a Topping patent wall-mount. Not bad! Tommy was gathering up a few more things, and Barry scored a pair of legs at the field that followed. The lovely personal personal trainer and Alison arrived last night, and after preparing dinner, and some general frivolity, we called it a night in preparation of day two. This morning, at the first field, Barry picked up a small iron corkscrew, I picked up a little stag handle, and was pretty much it. I passed on a 700 dollar pair of celluloid shoes. I did pick up a little sterling funnel with corkscrew, and a really cool Clough with DeCapitator which advertises Clough’s Decapitator. I have a small collection of Clough’s that advertise Clough, and was pretty excited to find it. 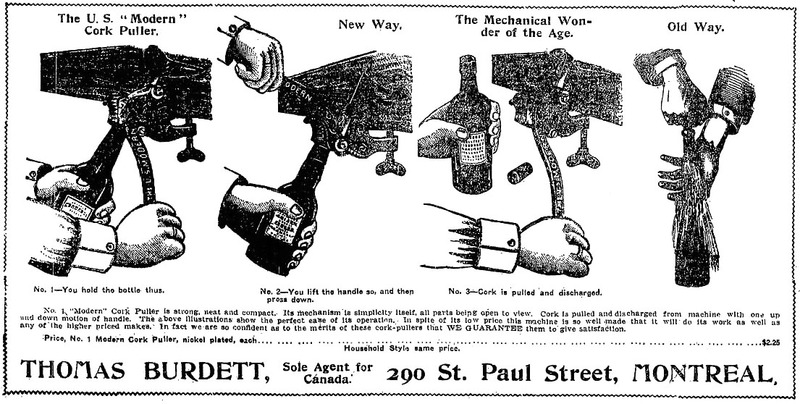 Coincidentally, on day one I found an advertising piece for Clough that didn’t include a corkscrew. 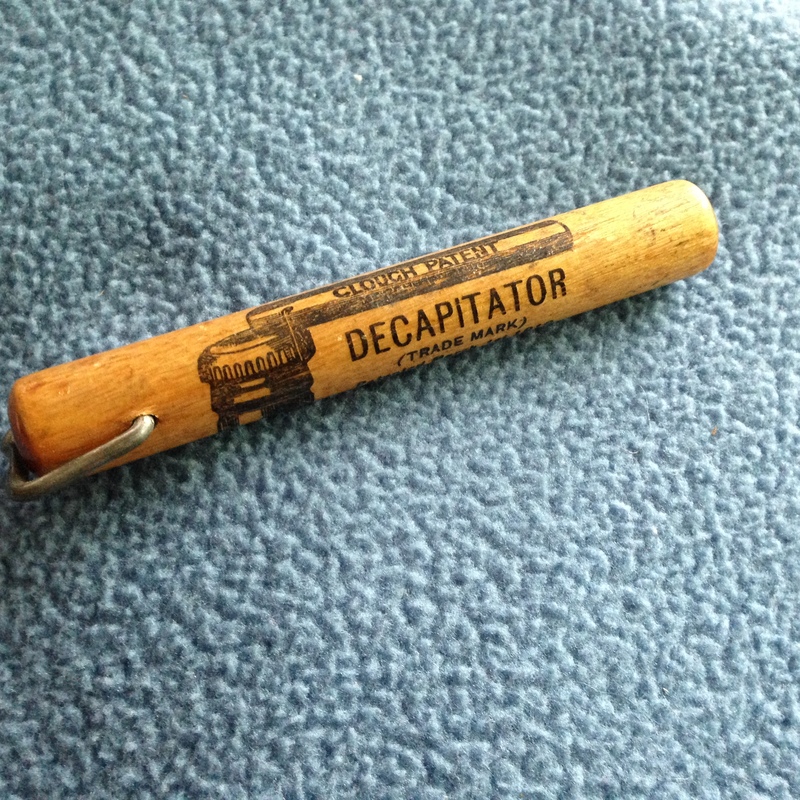 It too is for the decapitator, and I have never seen one before. A nice addition to the collection. Longer than any Clough sheath I have ever seen, there is no opening for a corkscrew to be screwed in. Have you seen this before? A pretty good show for all of us. Tomorrow is May’s, and the hunt will continue. 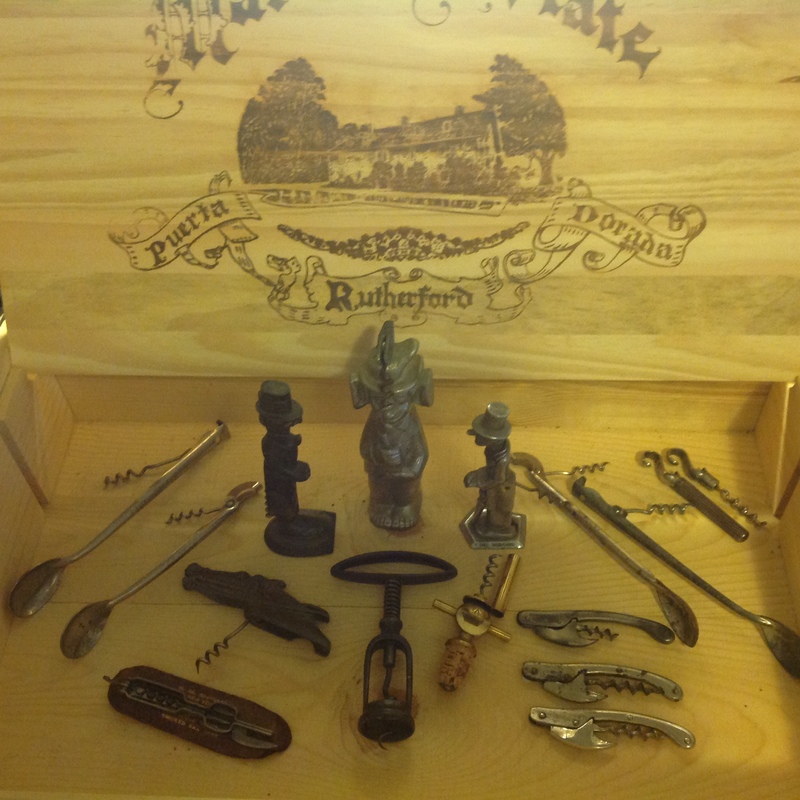 Apparently word is out that I collect corkscrews. I know, that this is pretty obvious to all of you. 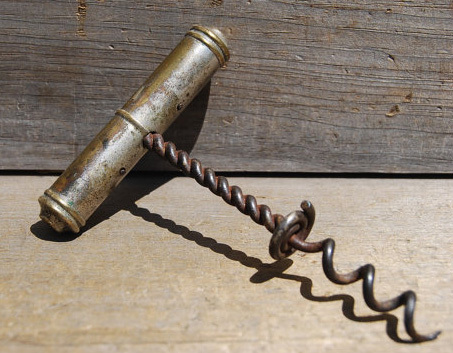 Still, over the last couple of days, I have received emails with pictures of corkscrews, Facebook messages about corkscrews, and at our local post office had someone describe an old corkscrew that they found at their mother’s house (she has promised to bring it in, for me to look at it). 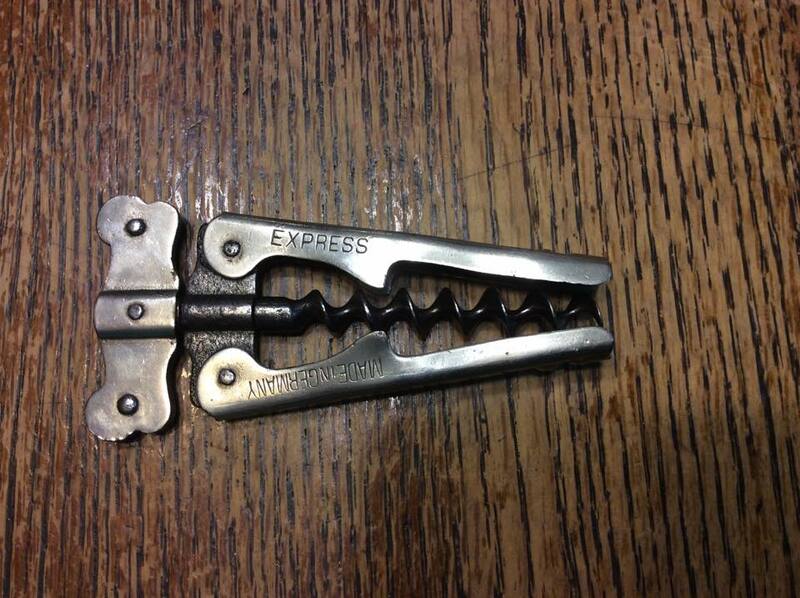 In the images sent via email, one corkscrew definitely jumped out at me. And, I have requested it be thrown into the Josef pile, and negotiations have begun. An oblong handled Frary with the Hercules frame, it looks to be a double, but given there are several different sized handles on the Frarys, I will have to get it in my hands for comparison. 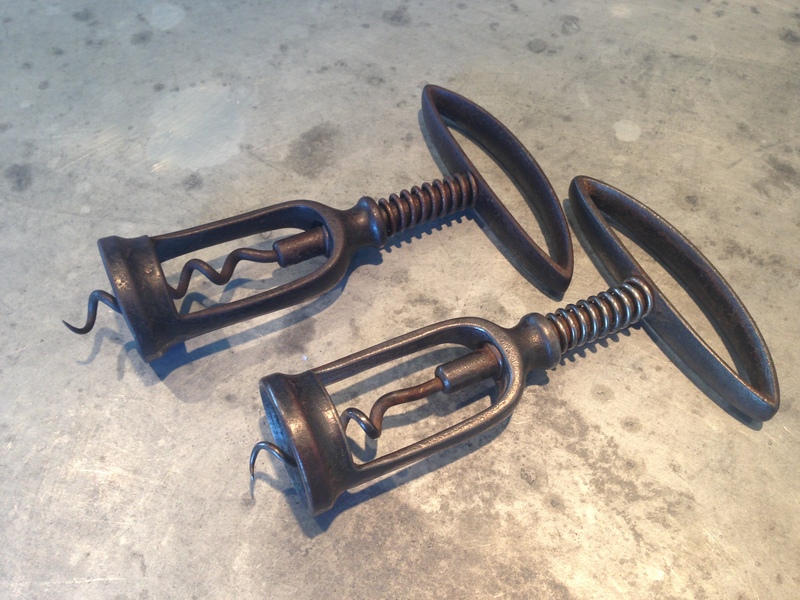 On the Facebook front, last week, a kitchen tool collector shared that he recently found a corkscrew in his hunt, and posted a photo. Over the course of the last week, we have been messaging back and forth, and yesterday struck a deal. I have never owned an Express before, and it looks to be one in pretty good shape. And, as previously mentioned, omorrow I head to Hartford (to pick up Tommy) and then we are off to Brimfield. I am actually hunting for a few things other than corkscrews this trip. Not that I am not hunting for corkscrews.